Why would you think that a database from Moby would help you with installing any games? It crashed, dumping this to the terminal window. I have absolutely no clue what could be wrong. I'm anxious to have a DOSBox frontend as easy to use as D-Fend Reloaded, and DBGL seems to be the best (maybe only) candidate for Linux. If anyone can point me toward what could be going wrong, I'd be very very grateful. Please use Java 8 for now, the current DBGL release is not compatible with versions 9 and up. I'm hard at work on a new DBGL release, but it will require some more time. Is there any way to fix it? Editing a file perhaps to correctly parse the Databases of the included ones? bola1717 and Blairwitcher, please take a look on the previous page of this thread, I already posted a fix for this specific problem. rcblanke wrote: bola1717 and Blairwitcher, please take a look on the previous page of this thread, I already posted a fix for this specific problem. My bad, I haven't checked that before asking. Hello. 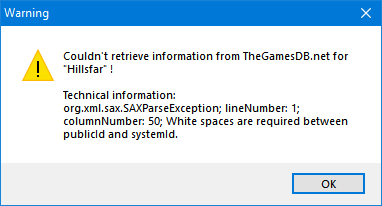 I know that this is a common complaint, but the databases aren't working again... or at least that's what it looks like. Pouet gives minimal information and there seems to be no option for Home of the Underdog. Thanks for the problem report hoarder, both issues that you mention should be fixed in this new maintenance build. Also Mobygames querying should work again (they switched to using https, thanks Bugurten). When I'm (finally) finished with the DBGL back-end rewrite, I'll start seeing if I can implement any new features, but for now these will have to wait, sorry. I already downloaded the latest version of DBGL twice. Is there something else I need to do? Do I wait for another update? Silverfish2910 wrote: Hello. I know that this is a common complaint, but the databases aren't working again... or at least that's what it looks like. Could you please remove the obsolete setting Collapse mode from the experimental options on the Display tab? There are also two new options in the pixel-perfect patch—glfullvsync (V-Sync in fullscreen OpenGL) and fullborderless (emulate fullscreen as a borderless Window, not in ECE yet)—but they have safe defaults and may be omitted in DBGL. Does one have manually to register the pixel-perfect output modes surfacepp and openglpp even though your front-end is aware of the pixel-perfect patch in ECE? It would be great it DBGL added those values to the output drop-down list for profiles based on ECE. Would it be possible to rename the fullscreen resolution value 0x0 into the more intuitive desktop? It need not be an alias translated internally back to 0x0, for you can specify fullresolution = desktop in the ini file directly. The changelog on the main website states you have to add those settings in. Also, openglpp just became available in the 4180.3 build of DOSBox ECE which just came out two-ish weeks ago. 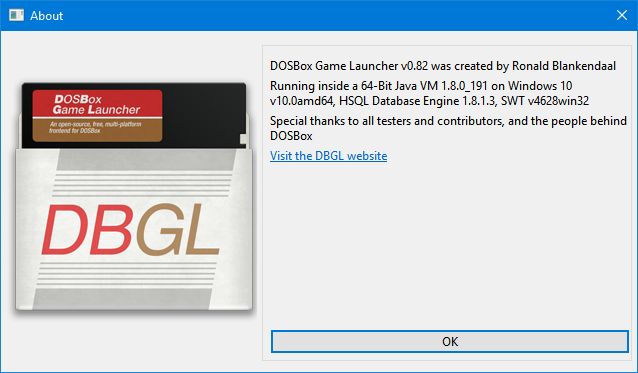 It would be hard to expect DBGL to keep up with DOSBox ECE every time a new setting comes out. Of course I just noticed that DOSBox ECE build 4191 just released today with some enhancements to the pixel-perfect patch that might fix some of the screen tearing I saw using Screamer 2 and Screamer Rally with glide. It's slight but noticeable to the very picky. I JUST built working profiles in DBGL with ECE 4185 earlier TODAY! Oh-well, I'm not busy tonight. Thanks DBGL! I've been a long-time fan, sometime around the 0.77-0.78-ish, maybe earlier. I know I upgraded to the latest jar file several times. I hope to see more integration soon between DBGL and DOSBox ECE like the missing pixel-perfect related settings. First of all, thanks for your patience in regards to the lack of updates for DBGL these last months. As I've reported before, I wanted to rewrite part of the application in an effort to make it more robust and future-proof. I kept relatively radio-silent in this thread because I didn't want to get too distracted with other tasks while doing the refactoring. Now, I think I have finally reached a point were it's okay to let you guys try it out. Still, some features are not entirely finished and there are some known issues, so please consider this 'alpha quality'. As always, I would appreciate any bug-reports and/or suggestions. DBGL's interface has hardly changed in this new release, but if you spot anything out of the ordinary which you believe might indicate a bug, let me know. Please be careful when ugrading DBGL; make a backup of all folders (except dosroot) inside your DBGL directory if you value your existing data! To upgrade, update the dbgl.jar as usual and update all jars in the LIB directory. Windows users also need to update launch.exe . On a side-note -- Expect bug-fixing support for DBGL 0.82 for at least the coming year. Any users with 32-bit systems (using Java < 9) may still report issues, although it is unlikely that I will be adding any new features for DBGL 0.82. Last edited by rcblanke on 2019-2-25 @ 21:24, edited 1 time in total. ... thank you for your good work with DosBoxx Launcher! Fixed ECE [midi]mt32.reverse.stereo, mt32.verbose, mt32.thread to use true/false instead of on/off. After testing Alpha 1 & Alpha 2, I´ve found a big problem. Both Alpha versions messed up the "long foldername" in mounting. For example, the mountpoint of the game "Aces Of The Deep" is: mount C "Aces Of The Deep"
But if I edit the config file with the Alpha version, the mount point is cut off: mount C "Aces"
This affects all configurations with long foldernames. All long foldernames are cut off in the config editor. Thanks for the heads-up ANGO, the issue is fixed in ALPHA3. Question - are the Fluidsynth driver/soundfont sections supposed to be operable yet? Hi, I downloaded (updated) from the latest version at http://members.quicknet.nl/blankendaalr/dbgl/ but fetching meta-data via Moby doesn't work. > Moby Games returns no results for "Commander Keen"
Tried it with lots of other words, always the same. I noticed that the feedback dialog comes _almost_ instant, like it doesn't even try. Unfortunately I couldn't find any debug log or so to dig into this myself. Pouet.net seems to work for some I tried. I don't care much abuot pouet/thegamesDB but Moby would be nice to get working again.